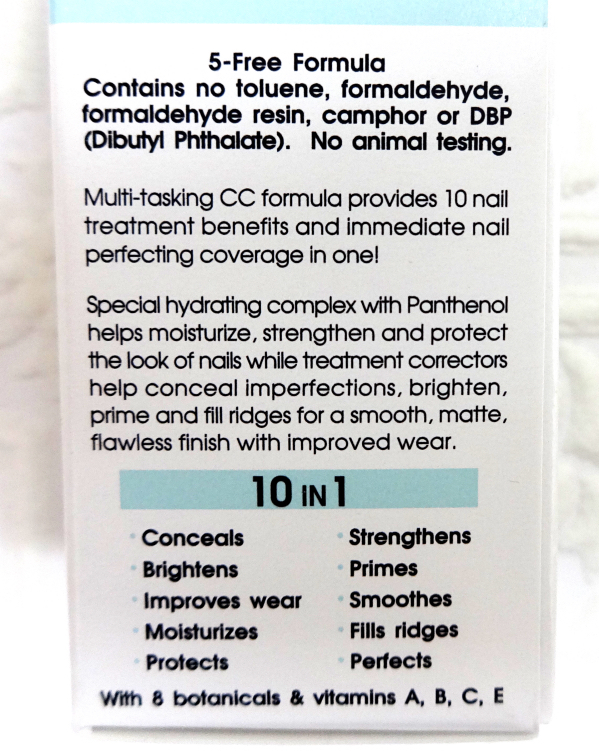 So "CC" even for nail base coat, yes? 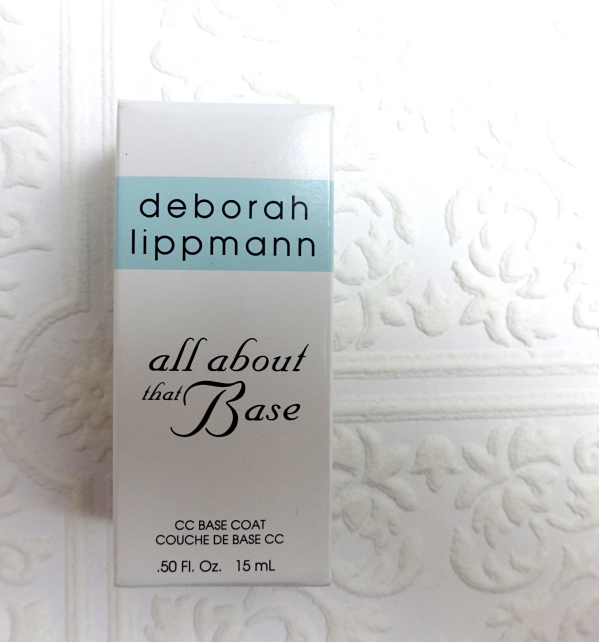 In this case, "CC" means "Correct and Conceal", and Deborah Lippmann All About That Base does that very well. Thanks to my mom, I have nicely shaped nails that are also strong enough to use to open a soda can (I shouldn't, really). However, they are stained because I paint my nails all year round and some of them have uneven spots on. This wouldn't be a problem during autumn and winter when I sport mainly opaque vamp and red polishes. But, it is finally spring here in the city. I want to wear sheer airy nail polishes again. No sheer polish would cover the unsightly stains and spots with just two coats, but I don't believe in wearing more than two coats of nail polish, sheer or not. All About That Base solves this dilemma. As you see the descriptions in the picture above, it claims to do everything. I have to say it pretty much lives up to its claims, although "Perfects" is thrown in to make it ten (*rolls eyes*). My nails do feel hydrated and it visibly covers the stains leaving a soft matte finish. In fact, you can wear this base coat then follow with a top coat to achieve the uber natural yet polished effect. 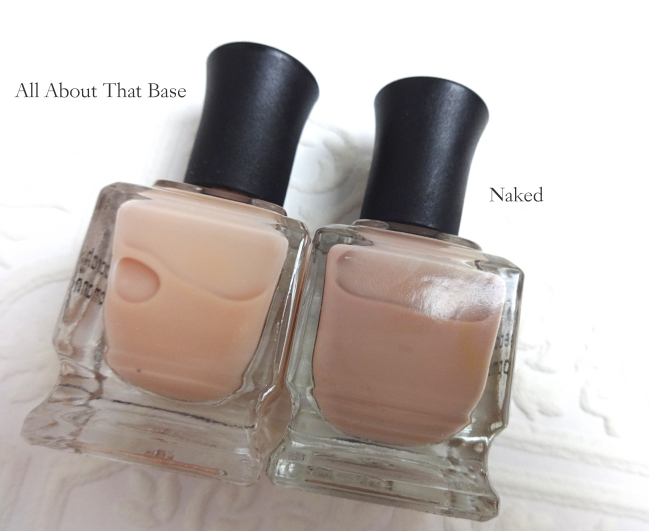 Just for fun, I have compared Deborah Lippmann Naked nail polish to All About That Base. Totally different colors and effects. I will write more about the Naked later on. I even have a matching lipstick. 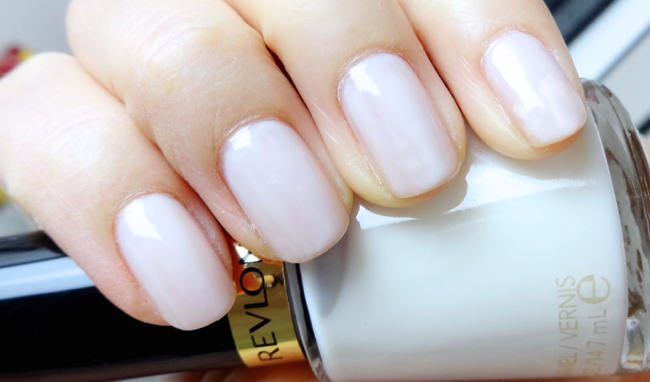 Here is a NOTD picture with Revlon Nail Enamel Sheer Sweetie (008) which is a demure off-white with a sheer finish. Over All About That Base, two coats of Sheer Sweetie looks just perfect. Deborah Lippmann All About That Base CC Base Coat is a welcome addition to my nail wardrobe. Maybe having a good nail foundation isn't much different from having a pair of underwear that fits you perfectly. What is your favorite nail base coat? Glad this works so well for you! I've always used clear base coat but having other options with more coverage is great. I actually haven't used any base coats before. I just slap on the nail color and call it a day. When I have more time, I'll use top coat. LOL! Please don't hit me. HAHAHA! I'm going through a stained nails phase myself and really trying to avoid putting anything on. Once the stains are gone I'll give this one a try to secure my nails for future damage. Taking a break is a really smart thing to do if you think your nails are stressed. I've also used non-yellowing kind of base coat but I guess constant nail polishing and acetone use does damage the nails. LOL at Lily! I would have even MORE stains if I skipped base coat! And LOL at no before photo - I totally understand. That's the point, right? Haha. I didn't even think to look for something like this, but it's perfect! I have the same problems - stained nails from dark shades, and having polish on frequently - and now I want to wear pretty, delicate shades, too. You're a genius! Thanks, Lena! Although now I'm out $20, so maybe not, lol. Ooh nice! I like two by Nails inc - one is a reddish sheer gel type one and the other is a white satiny one..i cant remember either of their names tho..d'oh!! I like the idea of these coloured base coats! I've seen pink/purple tinted base coats are marketed to combat yellow stained nail. They seem to work quite well. This CC base coat is more of a milky one and provides better coverage. I usually get a nail polish phase mid spring to summer, then look at my stained yellows and stop wearing for 6 months! I use a hardening clear base coat from Kiko cosmetics, purchased in London for around $5 cad and love it! Oh, I wish I could go off nail polishes for 6 months! But I think that's actually good for your nails! CC for the nails? very cool. love the idea of a correcting base. the color used here is very pretty for spring. I hate that BB/CC naming conventions have spread to even nail polishes but your point about layering them under sheer shades is great! I have Naked and love it but the other day I got tired of adding all the layers and erased the whole thing mid-process, LOL! Maybe the CC would have saved me. If you're into cuticle oils, the DL one is excellent too. I think she makes some nice basic nail accessories even though she's lost the colour and glitter game to a lot of indie brands.